This book and its accompanying Teacher's Pack are the result of a project, supported by the Nuffield Foundation, to provide flexible learning materials for the Basic Application of Number core skill for both the NVQs and GNVQ in construction and the construction crafts. 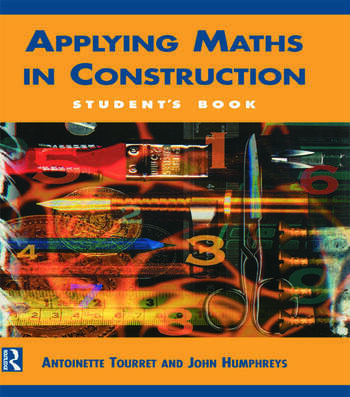 The student book uses a unique approach to explain how mathematical principles apply to construction tasks. Each chapter forms an individual construction project and uses the full range of number skills from the fundamentals of addition and subtraction to statistics, trigonometry and technical drawing. Successfully completed projects provide the student with the required portfolio of evidence for their course. Notes throughout the text refer the student to the relevant module in the Teacher's Pack, which contains assessments, tests and detailed explanations of the number skills needed to complete the projects. Introduction * Project one: Decorating a room * Project two: Designing a staircase * Project three: Planning kitchens * Project four: Excavation for a swimming pool * Project five: Material requirements for a detached garage.